Do you always have bananas rotting on your counter too? Yeah, me neither. Actually I lie. There are weeks when my family eats 3 bunches of bananas, and weeks when those bananas get neglected. Most of the time those bananas get put into a smoothie, or into the freezer for later use. But sometimes, a girl has to bake. And oh my word is this cake good. It tastes like banana bread, in a lighter, cakier form. Does that even make sense? Is cakier a word? Don’t judge. Go bake this soon. You won’t regret it. Here’s the thing. It’s so good out of the refrigerator the next day. I can’t decide if I like it better plain or topped with nutella and walnuts. Maybe we can take a vote. Go make this and let me know what YOU think! In mixer, blend butter and sugar until creamy. Add egg and vanilla, beat until combined. Blend in bananas. Add flour, baking powder, baking soda and salt. Bake in a 350 degree oven for 25 minutes. Refrigerate. I like it best served the next day, out of the refrigerator. You can also dress it up by drizzling some nutella on top and some chopped walnuts. You decide! Yum! This looks delicious. I found your post at the These Chicks Cooked site. oh this looks great! i’m putting together a post on all sorts of recipes u can make with bananas can i include this? Delicious. Chocolate and banana are just wonderful together. I wouldn’t be able to pass up the Nutella topping….definitely a must. Sounds delicious. 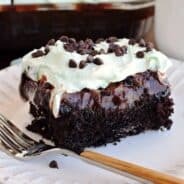 Stopping by from WOB Wednesday – I could get into a lot of treat trouble with all this yummy recipes! Love the combo! Thanks for sharing! I guess bananas were a popular item this week! This looks delicious. That dollop of Nutella on top just makes it all so perfect. Banana bread is always being made in my house. This looks absolutely amazing!! This looks so good! I have way to many bananas and they are overtaking my freezer. I will be making these this weekend. Thanks for a great post! Great recipe that we will really enjoy. Thank you so much for sharing with Full Plate Thursday and I look forward to seeing you again real soon. Yes, I always have rotting bananas in my kitchen. My children want bananas in the grocery store but no one will eat them when we get home. Thsi looks delicious. I’ll bet the nutella and banana work well together. Thanks for sharing on A Well-Seasoned Life’s Sweet Indulgences Sunday. Chocolate and bananas are a match made in heaven. This cake looks so moist! Thanks for sharing. Hi Amiee! 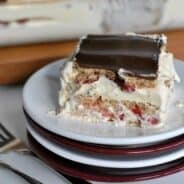 Thanks for your kind words on my blog 🙂 I’m glad I found yours, its awesome and I love the recipes! 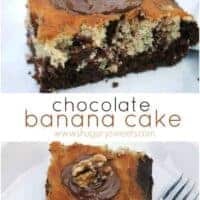 This chocolate banana cake sounds amazing, and I just happen to have some bananas in the freezer begging to be baked already. I’m making this!! Love it, going to feature your cake on Friday at Bacon Time. Thanks for linking and hope to see you this week. Yum! That cakes looks so good! Great recipe! Yum! 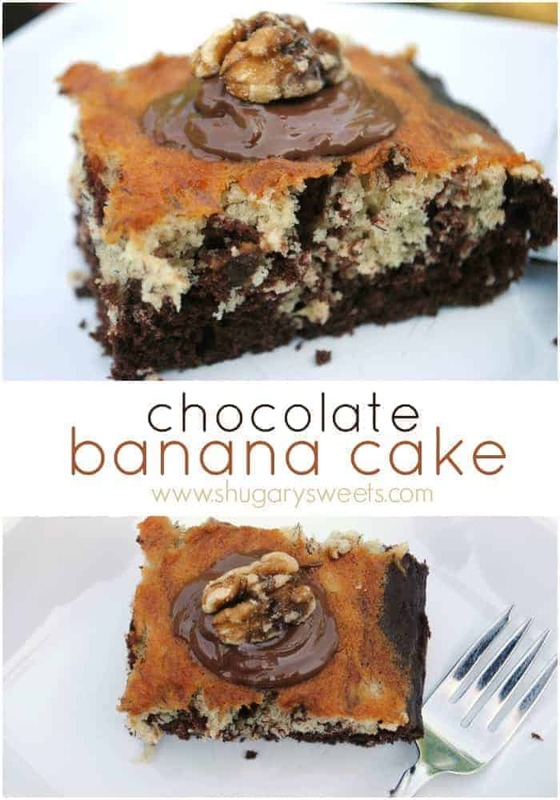 I’m going to buy some bananas just so I can let them get overipe and make this! (My kids always ask for them and never eat them!) I think the Nutella would be delish! I love finding new ways to use those over ripe bananas! This looks amazing – pinning & fb sharing 🙂 Have a wonderful weekend! It seems very yummy but there is one thing wasn’t clear, you said divide the batter into two and add coca , what happens to the other half? 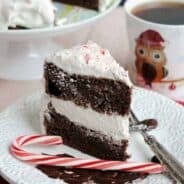 Chocolate, cake, and breakfast are some of my favorite words to be said in the same sentence! This is my kinda breakfast! Chocolate & Banana are amazing together. Made this today. It was a little dry. Shouldn’t it have some other type of liquid, like buttermilk?